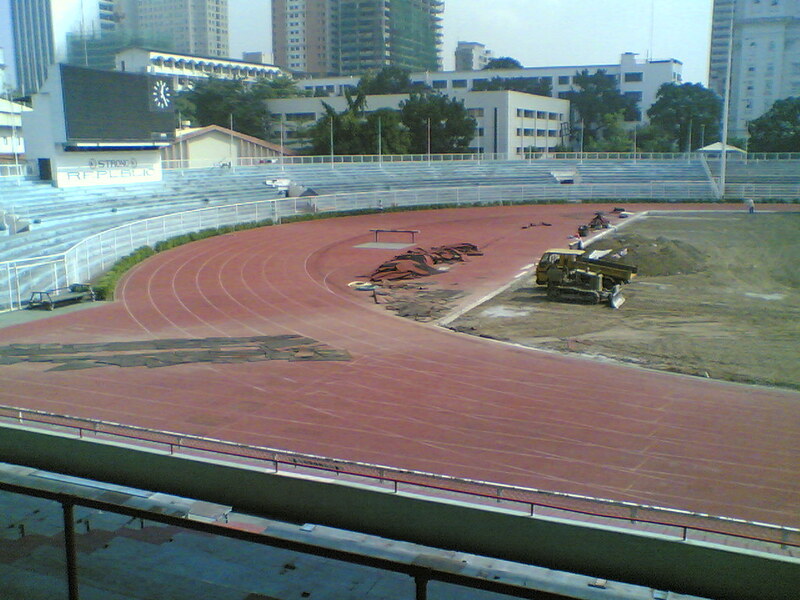 When I went back to Rizal a couple of weeks ago, I was a bit puzzled at the lack of people running in the track. The recreational runners and youth athletes were nowhere to be seen. Except for a few national athletes, the stadium was practically deserted. I dismissed the observation and went about my training. After shooing away a bunch of kids loitering by the football field, a security guard approached me whilst I was doing hurdle drills. She asked if I were an outsider. “I’m with the national team,” I replied, not wanting to abbreviate my training session. I asked Sheena about this and her answer confirmed my worst fear. Rizal is closed to the general public, as it caters exclusively to national athletes for the time being. My heart sank. This means shifting my weekend training base to the worn out track of Ultra from the comfortable, athletics-centric aura of Rizal. I could have continued lying between my teeth. I wasn’t raised that way, mind you. If the PSC deems it fit to close off Rizal to help our athletes better prepare for the SEA Games (or due to the renovation controversy), I’m okay with that – whatever the true reason is. It’s a privilege our national athletes deserve. Besides, it’s not like I’ve been deprived of a training venue. Ultra is still available, despite the poor state of its synthetic track. I don’t know when I’ll be able to train in Rizal again. Until then, I have to make do with what I have and make adjustments to my schedule. The problem was purely psychological. In the past few weeks, I had difficulty clearing the senior hurdles. I hesitated. I was scared, considering the fact that it has been more than three years since I last sprinted over the actual 1.067m high barriers. All the pent-up frustration soured my mood and pulled down my confidence level. I almost reached the breaking point last Wednesday. I couldn’t seem to get my act together. I couldn’t focus. I started to question the very reasons for my comeback. Fortunately, fate found other ways to lift my spirits. I had good nonchalant talks with a college block mate, a couple of high school teammates and a colleague from work. God seemed to take pity in my solitude! I worked doubly hard to keep my emotions in check and settled for junior hurdles instead. As expected, I breezed through the workout. My technique and physical conditioning are adequate. It was the psychological aspect that spelled trouble. To stem the bloodletting, I took two days off. I watched Peaceful Warrior again, just to get my wits together. Prior to yesterday’s workout, I was still somewhat apprehensive – and scared. The visualization techniques from the movie did much to calm my nerves. Despite a few botched start attempts, I kept my emotions level. With my legs well-rested and my mind at peace, I stormed through the workout! For the first time in more than three long years, I had successfully cleared five senior hurdles. The long wait was over. I felt like a true senior hurdler again. Whilst doing my post-workout stretches, I wanted to shout from the bottom of my lungs an emphatic “hell yeah I’m ready for the Nationals!” But then again, my good manners took hold over such a wild gesture. Last Saturday’s Rizal training started decently enough. Perhaps it was the heat or the sheer emptiness of the stadium. The solitude can get into one’s nerves, even for the most resolute of athletes. I had difficulty transitioning from clearing the first hurdle up to the second. I felt that my strides were inadequate, instinctively prompting an abrupt brake. For a hurdler, this is a big no-no. No matter what, a hurdler should strive to clear the barriers. This had happened to me in the past. A good talk with my coach (or my training buddies) gave enough adrenaline boost. Most of the times, however, I let my bad temper get the better of me. This time around, I did not have the luxury of devoted coaches and teammates. The main culprit was the lack of speed in my starts. So I took extra time to rest in between reps. I listened to music whilst visualizing the entire hurdling motion. And it worked! Although it wasn’t the best of workouts (technically), I was glad to find my mojo again. For the first time in years, I actually cleared 10 hurdles (junior) and ran over senior hurdles. This is a major personal milestone. At the end of the workout, I had a good light chat with some national athletes. In the hallowed stadium of Rizal, I felt so much at home – and at peace. More importantly, I’m becoming more and more of a hurdler with each passing day. The past few weeks had been quite hard. The stresses of training alone had been getting into my head. No man is an island. Although solitude is at times, beneficial, there comes a point where the silence becomes too deafening. I was becoming stale as I went through the motions of hurdling and sprinting. There was no intensity. I started to doubt myself and my ability to compete head-to-head with the nation’s best hurdlers. I was on track to another lackluster workout yesterday afternoon when I bumped into Ninoy Marayag in Rizal. I haven’t seen the guy in months and, naturally, we talked about all things track & field. I confided my self-doubts. The national level triple jumper was very supportive and prodded me not to scrap my plans of competing. The mere presence of a friend did wonders to my training session. He was able to spot some deficiencies in my hurdling (trail leg doesn’t snap forward, flailing arm action). Even if he’s a triple jumper, he knew the basics of hurdling. His inputs were very helpful indeed! Ernie Candelario, the 2003 SEA Games 400m champion, was also there with his family and some national tracksters. After one good run, I saw him clapping and widely grinning. I basked under his praise! I grew up reading about this guy’s exploits. Hell, I idolized his quarter-mile running. To see him clapping at my hurdling was simply flattering. The slew of frustrating training sessions were stopped, thanks to the mere presence and support of Ninoy and Ernie. Ninoy shared an Ilonggo saying, which loosely translated into Tagalog: “Hindi pa nagsisimula and laban, panalo ka na.” In English the line means winning in your mind before the start of the actual competition. It was a wake-up call. I realized how soft I had become in the years I spent away from the track. Self-doubt is the worst thing an athlete can do to himself. In the coming weeks, I’ll be gradually reaching my peak in time for the National Games in Bacolod. Everything is on target. There’s this term in securities trading called “cut loss.” Simply put, cutting your losses means selling a particular losing position. It ends the blood-letting potentially bigger losses and enables the trader and the institution to absorb the trading loss outright – to start anew with a clean slate. Last Saturday, I did just that in my hurdles session in Rizal. I couldn’t seem to find the speed in my legs. I was having a hard time maintaining good form over the hurdles and in-between the barriers. At first, I wanted to blame the bunch of joggers loitering around the 50m mark. They were distracting, all right, but I know for a fact that it takes so much more to put me out of my hurdling groove (hell, I train in Ultra at night, where joggers literally crowd the track). I had to clear youth hurdles again, just to enable my body go through the motions. But still, something felt horribly wrong. I sat on the moist track, just to compose my thoughts. I did n0t have the luxury of time. I had a seminar for work scheduled on 8:00 AM (I got to Rizal at around 6:30 AM). Soldiering on will be counterproductive, I told myself. Moreover, I was feeling a sharp pain in my right calf. My ego wanted to push through, of course. I’m not the type to shirk from a challenge. But then again, I’ve been through the same situation before. The best move is to cut one’s losses, to retreat and fight again another day! I’ve put a tremendous toll on my body the past week as I juggled training with commitments at work. A botched training session was the price I had to pay. I rued the missed training opportunity well into the remainder of my weekend. I felt the frustration seep into my very bones. I shut out my ears to the screams of my overwrought head. I rested the entire Sunday, opting to skip my gym and plyo’s workout. My right Achilles was acting up yesterday. I surmised that it was from the hurdles workout last Thursday or from wearing leather shoes all week long. I felt crappy during warm-up. I wanted to err at the side caution and simply go home. I can ill-afford another injury. But lo and behold, the pain disappeared once I wore my spikes! During my hurdling warm-up, the pain was totally gone. My weekend Rizal workout was saved. Rizal was almost devoid of people. The pole vault guys were competing in the Filipino-Chinese meet in Ultra, so I was left training alone. I must admit that it was an eerie feeling, having the stadium all to myself. In the middle of my hurdles workout, a few training pool members and a national team decathlete hung around the 1st hurdle mark, to kill time before their training. I’m not used being around real track and field athletes anymore since I train around fitness enthusiasts and recreational runners most of the times! I was quite dazed and distracted by the national team guys. After all, they are much better athletes than gym buffs and joggers! Since a couple of those guys also do the hurdles, the pressure to perform well naturally built up. I shrugged off those irrational emotions and buried the my inferiority complex underneath a new-found confidence in myself. I told myself that hell, I was once one of the top hurdlers in the Philippines. It’s just right to walk with some swagger. Putting my game face on, I had my best hurdle workout to date. I was satisfied with my starts since I didn’t slow down before the first hurdle. Again, I had some difficulty transitioning from hurdle clearance to sprinting. More importantly, I’ve found my hurdling rhythm albeit a considerably crude version of it. It was a decent effort altogether. Yesterday morning, I went to Rizal for my customary weekend hurdle workout. Instead of the usual afternoon session, I joined pole vaulters Jerome Margallo and Tonio Ching in Rizal at 8:00 AM. I’ve forgotten how hot the Manila sun can be without adequate shade. Being the night owl that I am, naturally I wilted. Back in the day, I was an all-weather kind-of-guy (I can compete and train under extreme conditions!). The stadium was a lot crowded than usual. A small group of DLSU tracksters were at the tail-end of their workout. On the far side of the track, Amir Khan himself was in the midst of an intense conditioning session. Also, there were the occasional tennis players competing in the ongoing Mitsubishi Lancer Junior Tennis competition. Being surrounded by gym habitues and running enthusiasts all week long, I found the company of elite athletes personally inspiring! I cannot recall the last time I trained under such harsh conditions. The sky was almost cloudless as the sun shone mercilessly. I looked with a certain sense of awe at the exuberant kids doing sprint workouts with nary a whimper. I was at the tail-end of my endurance. I wanted to hit the shower, pack my things and head straight to McDonald’s for my recovery meal! With two months to go before the meet, there was no time for such non-sense. So I soldiered on, resting in the cool dugout in between reps. It wasn’t the best of workouts, with the heat sapping most of my juice. Hence, I was careful not to transcend the limits of my body. Nevertheless, it was an eyeopener – a reminder that I should be ready for all kinds of conditions come competition time. At the end of the customary post-hurdle workout sprints, I felt so fulfilled. Despite my unwanted bout with the harsh mid-morning sun, I was on schedule. 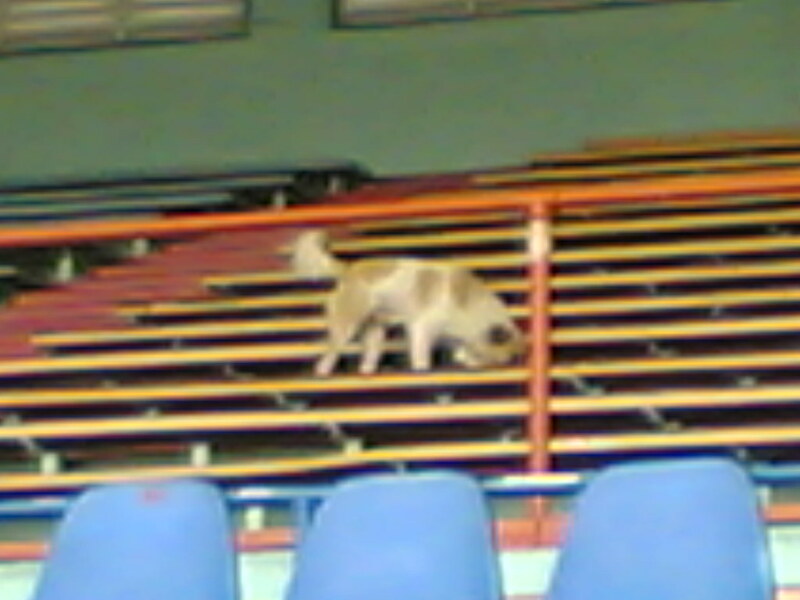 Whilst training in Rizal yesterday afternoon, Coach Jeannette Obiena noticed a stray dog lurking by the trash bin at the bleachers. The hardy askal (not Azkal, mind you), reminded me of the infamous dog chase during last year’s Commonwealth Games in Delhi. 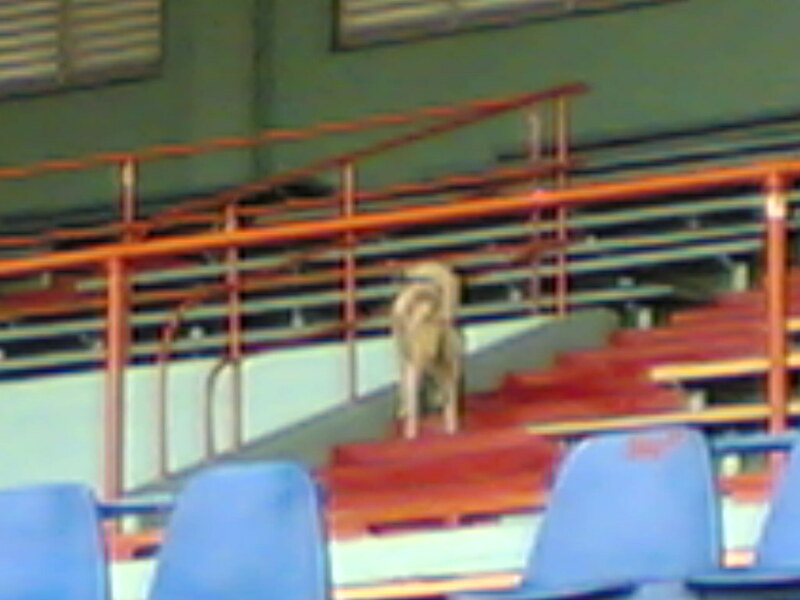 It might take a few generations before we see the rise of an athletics facility to rival that of India’s Jawaharlal Nehru Stadium, but hey, our very own Rizal Memorial Stadium is at par with the former – in terms of furry companions! The high cost of fuel (thanks to the Middle East crisis!) have necessitated a drastic revision to my weekend training plans. Instead of driving all the way to Ultra (a good 20-25km drive all-in-all), I had to think of a cheaper alternative. I didn’t want to train in Ateneo since I cannot use the hurdles there without a coach. Then it hit me, why not leave my car in Trinoma and ride the train all the way to Rizal. I’d hit two birds with one stone by (1) saving gas and (2) immersing myself in a true athletics environment. Last Saturday, I did just that. The change in scenery was refreshing. I must admit that several months’ worth of training solo amidst the oft-dreary company of joggers took a big toll in my extrinsic motivation. Even the LRT I proved to be a wondrous experience, since I’ve always looked at the run-down environs of Manila through nostalgic lenses. Despite the grime, pollution and relative chaos, my heart has a soft spot for the mighty capital city. When I arrived at Rizal, I couldn’t help but gawk at the majestic Art Deco buildings. I pictured the great Filipino athletes of a bygone age – the likes of Simeon Toribio, Miguel White, Carlos Loyzaga and Felicissimo Ampon – walking the same worn path. 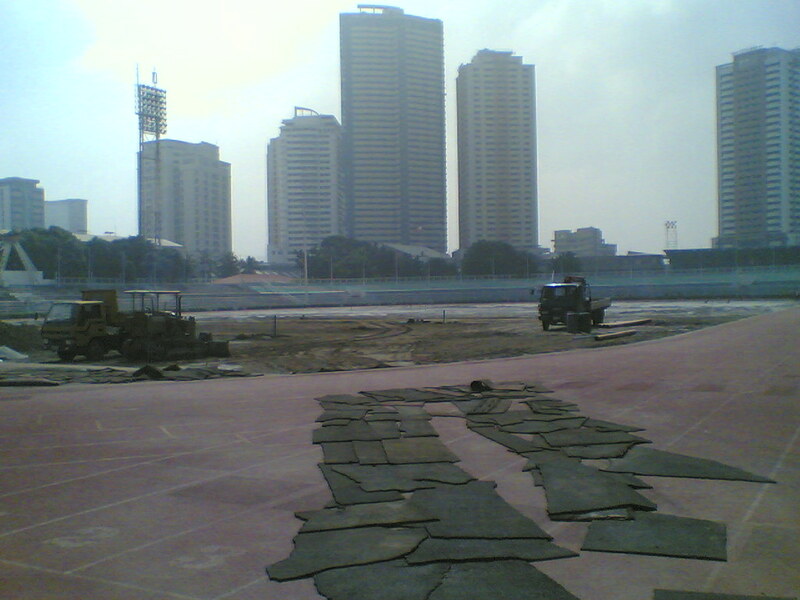 There’s so much history in the Rizal Memorial that one tends to overlook its dilapidated state. In light of my two year temporary retirement and the controversy regarding the renovation of the athletics stadium, I honestly did not think that I’d get the chance to hurdle and sprint in Rizal again. While I was doing my warm-up routine on the track that had seen my greatest victories and sorriest defeats, I was grinning like an expectant child on Christmas eve. Despite the distance, I felt so much at home in Rizal – more so than in Ultra or Celebrity Club. The fact that several of my athletics friends (Coach Emer’s pole vault training group and Robin Tuliao) were there heightened the endorphin high. The staleness that had hounded my training for the past few weeks were blown away by a familiarly refreshing breeze. Needless to say, the training session was superb. 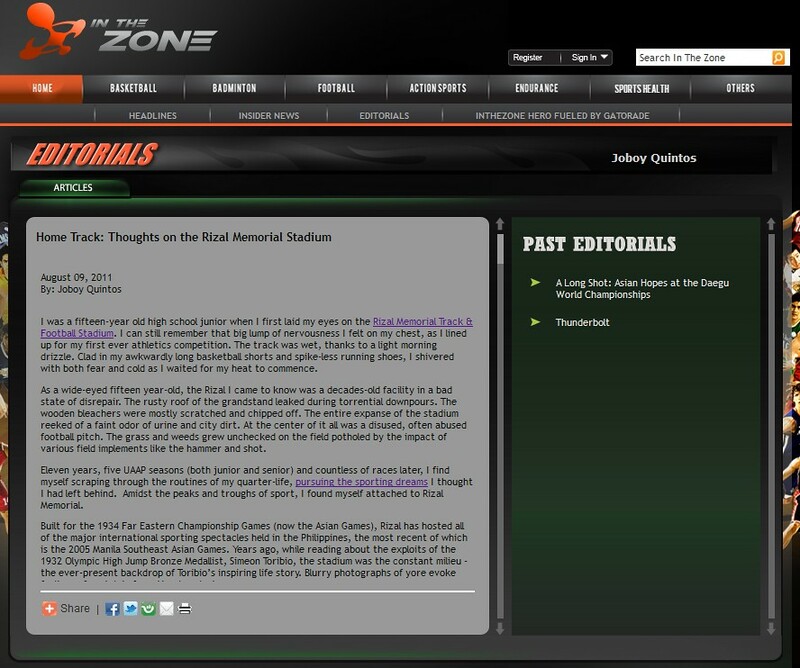 In my second hurdling session of the 2011 season, I hardly felt the rustiness of early season exuberance. My comeback will only be complete once I cross the finish line of a 110m high hurdle race below 15 seconds. But when I was doing nondescript five-step hurdle clearances last weekend, I felt so happy and thankful at being given a second shot. After dropping by our former team captain, Rob Sargan’s running shop, I decided to visit the good ole stadium. 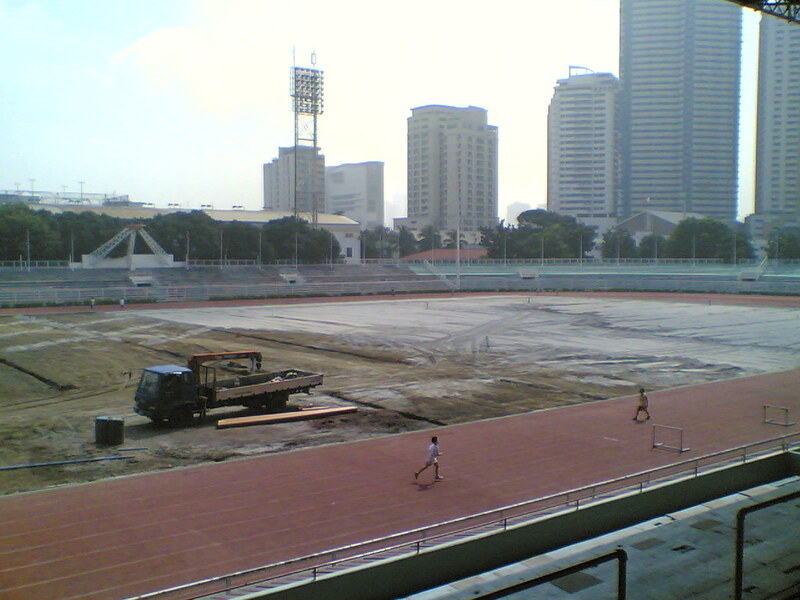 I haven’t been to the decades-old Rizal Memorial since February 2010. Since then, the controversial memorandum between the PSC and DLSU had taken center stage. Construction of the new football pitch is in full swing; the field events have transferred to faraway Teacher’s Camp in Baguio (for the throws) and to Philsports in Pasig. Seeing athletes train in the hallowed stadium brought forth fond memories. At least the track is still usable, despite a few holes here and there. The PATAFA Weekly Relays will be held in both Rizal and Philsports starting this November. I’ve heard much opposition about the legality of the aforesaid document. 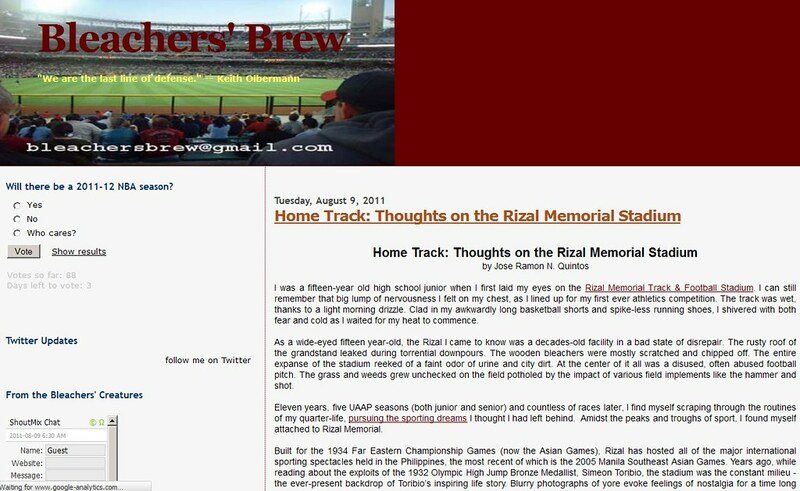 The inner workings of Philippine sports is a quagmire I’d rather not delve in. I’ll be keeping my fingers crossed until the issue is solved with finality. I hope the parties concerned come up with a win-win solution for both track & field and football athletes.